Closing Paris Fashion Week's A/W 2014 season, Christophe Lemaire delivered stealth, sartorial satisfaction for Hermès, from his oversized outerwear to pristine pantsuits. The show opened with an immaculate grey cashmere coat that set Lemaire's refined silhouette, thanks to its exaggerated collar and slouchy sophistication. It also winter-ised the first look's cream blouse and equally ecru pant, pointedly indicative of the chauffeured lifestyle that the Hermès client enjoys and indeed dresses for. From here, coats and capes morphed (literally in the second look's case), as the designer offered up leather anoraks and skirts that were engineered to last a lifetime - just like the treasured rings that hung from necklaces around his models' necks. Man-style 'suits', some featuring draped tops rather than jackets, were similarly well equipped for the longevity brief. 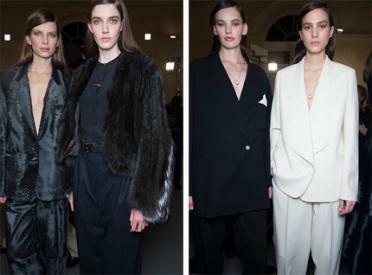 Housed within the equally stealth surrounds of Paris' former stock exchange, Lemaire's pared-back, utilitarian shapes then stretched from a cashmere toggle jacket for day, to a 'monkey hair' coat for evening, with a cream, shawl-collared tux bridging the two. Adding an exotic undertone was Lemaire's print component, sewing the house's iconic scarves - this season inspired by the Silk Road trading route - into the back of a shearling gilet, or printed onto a roomy shell-top, and worn over a crocodile wrap-skirt. Later, the same reptile would be cut into a three-quarter sleeved bateau tee. After all, marrying luxe fabrications with classic cuts is the Hermès calling card, no matter the weight of the season.